If modders had their way, Maya would be way more powerful. Ultimate Marvel vs. Capcom 3’s recent release on PC has opened the floodgates for a varied collection of mods. Since the game arrived on Steam last December, fans have tweaked the frantic three-on-three title in a variety of ways, from simple gameplay adjustments to complete model swaps. Owing to the quirky nature of its larger franchise, Ultimate Marvel vs. Capcom 3 is a title rife with debatable mechanics. As time has passed from its initial release in 2011, competitive players have discovered infinite combos (inescapable strings that could potentially go on forever if a player’s execution is good enough). Some characters have proven to be too weak for high-level play. A handful of community members are trying to change this by altering how the game plays. Others are trying to strengthen some of the game’s weaker characters. The modders working to improve the game are doing subtle but significant work. One such player, tournament broadcaster Sixfortyfive, released a pair of videos last week demonstrating his work shifting gameplay in new directions. His first, for instance, attempts to make Ultimate Marvel vs. Capcom 3’s Aerial Exchanges more like Tatsunoko vs. Capcom’s Crossover Air Raids. These techniques are also known as Team Aerial Combos (or TACs), allowing players to switch characters during an air combo. However, where the version in Ultimate Marvel vs. Capcom 3 uses no resources and maintains damage scaling (the damage deterioration that occurs as combos grow longer) when characters are exchanged, the latter uses one bar of super meter and resets damage scaling. Or, to put it in plainer English, the team aerial combos in Tatsunoko are more powerful than they are in Ultimate, which would naturally change the way the maneuver is used in the newer game. Ultimate Marvel vs. Capcom 3’s TACs are also the main culprit behind its infinite combos. By utilizing a few oddities in the engine, TAC infinites essentially trick the game into ignoring hitstun scaling (which, like damage scaling, builds as combos continue), making combos capable of continuing indefinitely. Sixfortyfive’s method for eradicating these infinite combos is to make opponents enter a recovery state (meaning they can’t be attacked) when hit by a TAC move. Unfortunately, this removes the ability to combo afterwards, but as a proof-of-concept, it leaves room to expand on this inelegant idea. His alternate, joking fix is to simply assume a player is able to pull of an extensive infinite, cutting out the lengthy wait time until a character dies by making TACs deal maximum damage. And finally, he’s working to improve the character Felicia, who has been in terrible spot in the Ultimate Marvel vs. Capcom 3 meta. Sixfortyfive put together a handful of changes that could help improve the Darkstalkers representative. Some of the adjustments include the improved ability to combo from a couple of her special moves and added maneuverability. Expanding on this idea of “fixing” the game, a fighting game YouTuber by the name of e mc dropped a two-hour video last week compiling balance changes he’d like to see implemented in Ultimate Marvel vs. Capcom 3. His demonstration shares ideas for weaker characters, including Hsien-Ko (did Capcom have something against Darkstalkers when making this game? ), Iron Fist, She-Hulk, and Iron Man. For the most part, these adjustments improve the mechanics that make each cast member unique, like giving Thor an extra air dash to help him close the gap on an opponent and use his close-range attacks. In order to show how these changes function in competitive matches, he also released another lengthy video of exhibitions matches he organized with another player named Killswitch. Not every mod is a deeply technical dive into Ultimate Marvel vs. Capcom 3’s intricate mechanics. Some fans are instead putting work into changing how the characters look, creating new costumes and appearances for the extensive cast. One content creator in particular, a YouTuber known as Lythero, released a project earlier this month that lets a background character get her due. 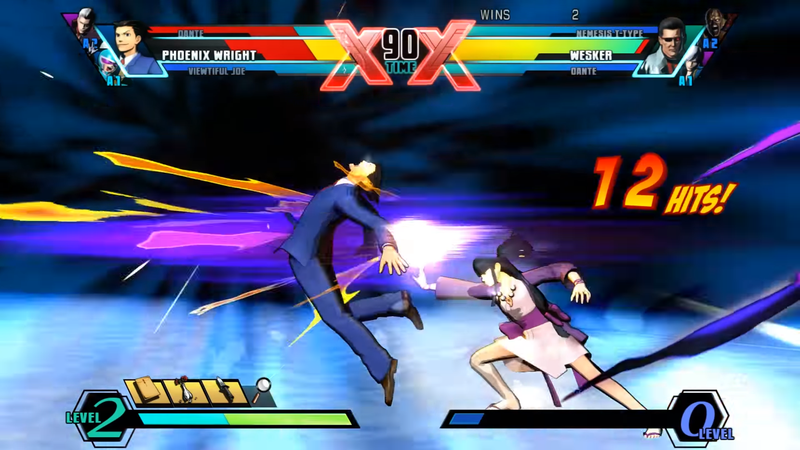 Using a tool developed by Super Smash Bros. for Wii U modder AnalogFlame, the videos in question shows how Phoenix Wright protagonist Maya would perform if given the moves of Resident Evil’s Wesker, Viewtiful Joe, Devil May Cry’s Dante, and even her mentor himself. The result is a couple of hilarious videos that shift Maya from the role of assistant to front-line fighter. Whether their goals are to solve lingering issues or update the game’s aesthetics, these Ultimate Marvel vs. Capcom 3 mods are giving new life to a six-year-old game. The modern fighting game community picks up and drops releases at a rapid pace thanks to the genre’s hectic release schedule, the above modifications harken back to the days of old, where players would grind and grind and grind their favorite titles because there was nothing else on the horizon. Sure, it’s entirely likely that Marvel vs. Capcom: Infinite will replace Ultimate when it launches later this year, but for now, this PC release has given this community favorite its second wind.